Who likes cellulite, fat or saggy skin? Anyone? Definitely not me. Unfortunately, I have issues with all three and I was on the look for a product that could aid in any way possible. I enjoy “value” sets because you are not committing yourself to a product that may not work for you and you could sample for enough duration to see its effect. This value set had enough product to last for 30 days, with twice a day application (except for the scrub which I only did once a day). I’ve been using the product for a month once a day and I give it a thumbs down. In the shower, place fatgirlscrub on desired body part and use the fatgirlstimulator to massage in circles. The scrub creates a flow and exfoliates. Following this, use fatgirlslim; massage 20-30 seconds onto desired body parts. Before sleep, use fatgirlsleep to massage the same spots. 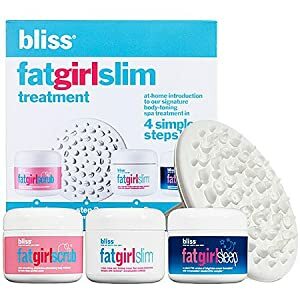 Overall, I would not recommend buying the fatgirlslim value treatment kit.